We can’t excavate everything so geophysics can help us identify what is under the ground without having to open a trench. Geophysics is the examination of the Earth’s physical properties to reveal buried archaeological features, sites and landscapes. We have used two different geophysical techniques at Caerau – one is called ‘magnetometry’ and the other ‘resistivity’. The top image was produced using resistivity. This measures the flow of electricity through the soil. Things buried under the ground can affect the flow of electricity. So for example, the stone foundations of a building, a wall or a bank might block the flow of electricity (high resistance), while the wet, organic soil filling a rubbish pit or ditch might conduct electricity more easily than surrounding soils (low resistance). On the image, white shading represents areas of high resistance and black the opposite. The bottom image was produced from a geophysics technique called magnetometry. This measures the magnetic properties of soil – these are often altered by human activity (e.g. burning, rubbish disposal, manure, industry etc) which produce highly magnetic soil. Metal objects in the ground (particularly iron) may also cause very strong magnetic readings. Archaeological features like buried ditches show-up really well because highly magnetic soil is washed into them by rain, or dumped into them by people, until they fill up completely! On the image, white shading is very magnetic and black the opposite. We can use these results to interpret what might be under the ground – are the ditches part of a defensive rampart or walls part of a building or bank for example. 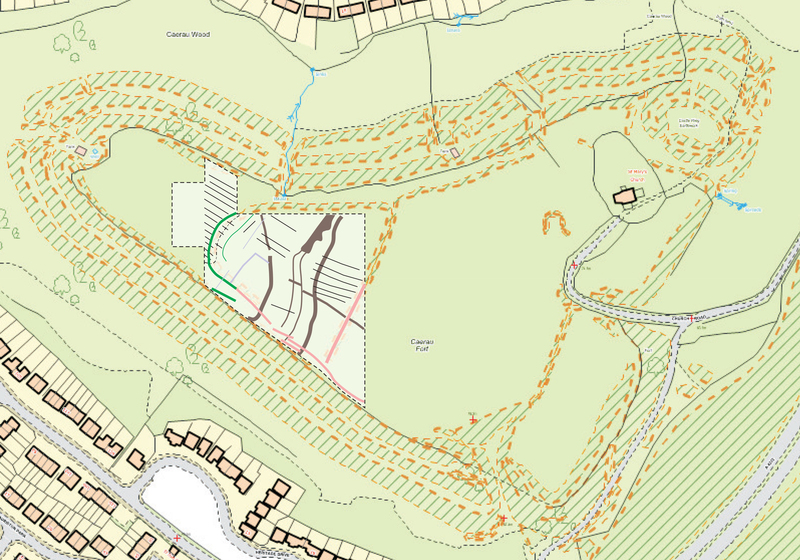 To see the results of previous geophysical surveys at Caerau Hillfort, click here.